2nd and 4th Thursdays, 6:30 p.m. to 8 p.m. 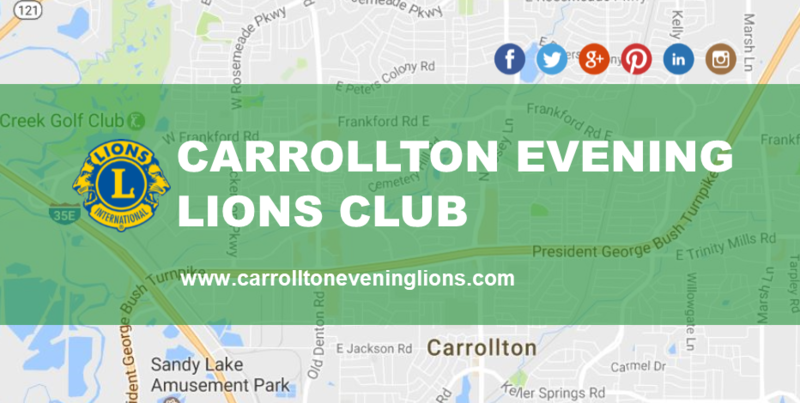 Since our inception in 1983, the men and women of the Carrollton Evening Lions Club ("CELC") have been serving our community and lending assistance to our neighbors in need. We have worked on a variety of service projects in Carrollton, as well as throughout the Metrocrest and in the Carrollton-Farmers Branch and Lewisville independent school districts. Some CELC service projects have included: providing free vision clinics at Vivian Field Middle School in Farmers Branch for Carrollton-Farmers Branch ISD students; collecting used eyeglasses; providing magic shows and movies for children; cleaning up the community during “Keep Carrollton Beautiful” work days; sponsoring physically challenged children at the Texas Lions Camp in Kerrville; supporting the Lions Sight & Tissue Foundation; assisting visually impaired children at the Sports Extravaganza held in Irving; hosting youth from abroad through the J.C. Hyer Lions Youth Camp; and more! CELC is one of the most active Lions Clubs in Texas District 2-X1 -- a large geographic area that covers Dallas, up to Allen, across to Commerce, down to Maybank, across to Ennis, over to Waxahachie, and back to Dallas. CELC meets on the second and fourth Thursdays of each month at 6:30 p.m. at the IHOP on Old Denton near Bush. If you’re ready to roll up your sleeves and get to work helping the less fortunate within our community, please join us at our next regular meeting to learn more about what we're all about.